A few years later, BYC decided to look elsewhere for a home of its own. In 1966, a suitable property was located on the north side of the Manatee River. Construction of the original structure began in May, 1967, and the original building, pictured above, was completed in January, 1968. 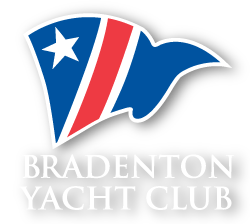 A BYC milestone was reached in 1971-1972 with membership topping 250, requiring the addition of a new kitchen, swimming pool, bathrooms and an office. Our Yacht Basin was completed and dedicated on May 22, 1976. Two tennis courts were added in 1985. Our ever popular Tiki Bar was built in 1987. On August 15, 1989, the BYC property was annexed into the City of Palmetto. Within two months, the membership voted to build our existing facility, a good move because membership had topped 500. With the new facilities completed, BYC now offered full restaurant and bar service to our members and guests.